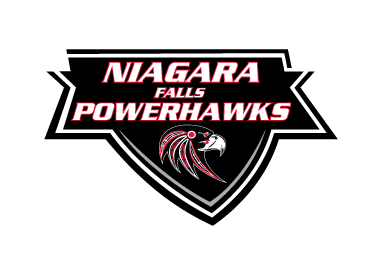 The Niagara Falls PowerHawks continued to struggle to score with a 7-1 loss to the Skylands Kings Sunday afternoon at the Skylands Ice World in Stockholm, New Jersey. The PowerHawks will return home for a trio of games at the Hyde Park Ice Pavilion next weekend. The first period was a Dylan show for the Kings with three goals scored by players named Dylan. Dylan Saccone scored the first two goals of the game, the first coming 2:14 into the period with Jake Cicalese and Travor Christoper providing the assists. His second marker, came on the power play at 8:09 of the period. Christopher and Steven Ford were credited with the assists. Dylan Dinkik scored unassisted with seven minutes left in the period. Miguel Mercado scored the lone goal for the PowerHawks at 12:35 of the second period. Jake Pembleton and Devin Johnson picked up the assists on the goal. Saccone completed his hat trick for the Kings 9:09 into the frame with the lone assist coming from Cicalese. Trevor Christopher upped the Kings’ lead to 5-1 7:44 into the third period with Zakary Sparks and Steven Ford adding assists. Dylan Dinzik was next up for the Skylands scorers. Coming with 6:17 left in the game, Cicalese and Ford added more points to their stats with the assists. Jake Lissy finished the scoring for the contest exactly two minutes later. Aslan Shetov and Zach Burkhart were credited with the assists. Tom Fornabia was 28 for 29 in net for Skylands in picking up the win. Noah Spiesz turned away 44 of 51 shots faced while in net for the PowerHawks. The PowerHawks will return home for a Friday night matchup against the same Skylands Kings at the Hyde Park Ice Pavilion in Niagara Falls. Game time is set for 8:30pm. Niagara Falls then plays a pair of home games against the Binghamton Junior Senators on Saturday and Sunday. Game times are scheduled for 6pm and 12pm respectively.